Pacific bluefin (Thunnus orientalis) is one of three bluefin species, together with Atlantic bluefin and Southern bluefin. Atlantic bluefin and Pacific bluefin only recently came to be viewed by marine scientists as separate species. Photo credit: George Mattson. In: Tuna and Billfish. Fish without a Country (1988). Courtesy of Inter-American Tropical Tuna Commission (IATTC). Although it is generally smaller than Atlantic bluefin, Pacific bluefin is also one of the largest of the tuna species, ranging between 80–200 cm in length. It has the largest geographic range of all tunas, widely distributed throughout the North Pacific Ocean — from East Asia to the North American West Coast — and with a more limited presence in the Southern Hemisphere. 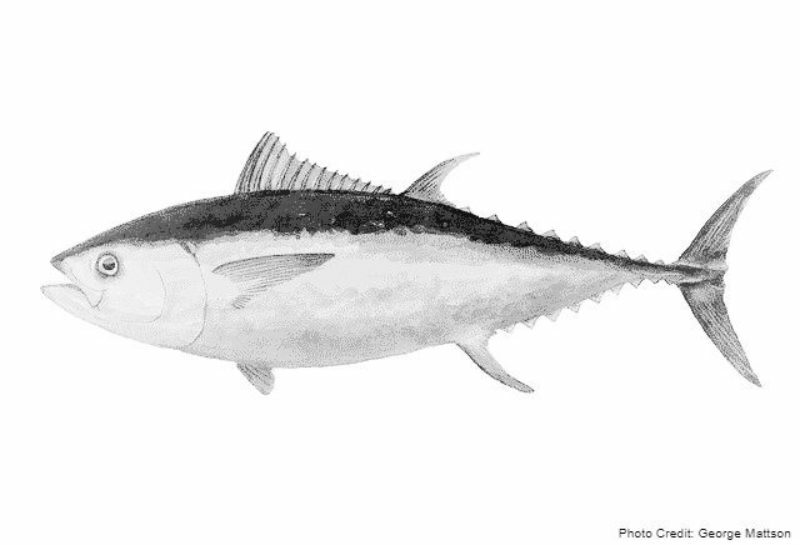 Thunnus orientalis is a temperate tuna species that can also range into tropical waters. It is considered to consist of only one stock and it forms schools by size, sometimes with other tuna and mackerel species. Pacific bluefin distribution is from the Gulf of Alaska to Baja California in the east (between 60°N and 20°N) and from Sakhalin Island to New Zealand in the west (between 50°N and 50°S). There are also records of this species around the islands of French Polynesia.